Landing pages are the front-lines of your product and the first interaction with new users. This is for an article I'm working on. How have you used landing pages to drive growth? - What are your best tips for turning landing page results into learning for your business? - What are the best tips for creating landing pages that work well? - How do you think about landing pages in the overall customer experience and conversion funnel? I look at landing pages when it comes to customer experience/conversion funnel like taking a girl out on a date for the first time. You want to put your best foot forward. You want to appeal to them and draw interest by being genuine (consistent brand messaging) which in turn will want them to know more about you (push them farther down your conversion funnel) and ultimately date you (conversion)! One thing I will say when it concerns language and could impede growth is too much information. When on a date, one of the worst things you can do is talk too much and bore your date. Same thing goes for landing pages, live by K.I.S.S. (Keep It Super Simple). Don't overwhelm new users with too much information. If you pull out your phone while on a date, not only is it a turn off but its also a distraction and breaks your attention away from your date. Same goes for pop-ups and or too much navigation or anything else that distracts new users from taking the action you want them to take on your landing page. One last thing, sharing is caring, optimize the page for social sharing. - Find language/market fit with the value proposition and messaging that resonates. 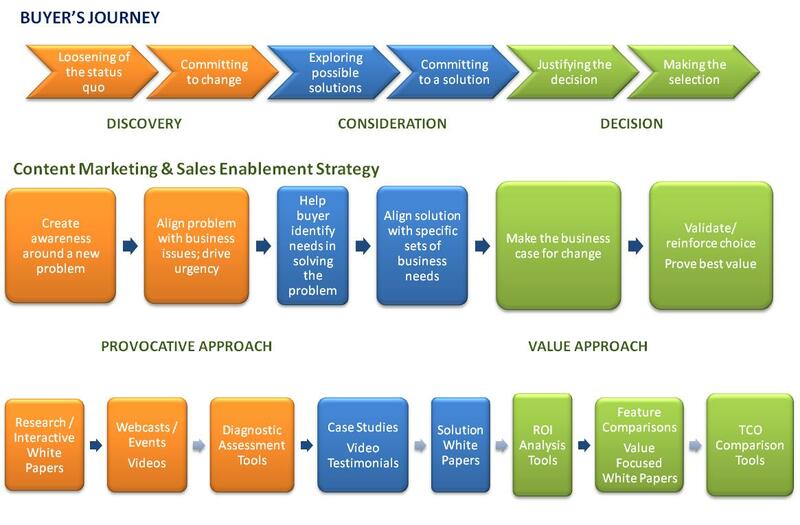 Mapping content to the buyer's journey. Hey @nichole thanks for weighing in. Can you elaborate a bit? I think I know what you mean--like hey we have this person in this part of the journey and we want to deliver content to them (e.g. an ebook or video, etc. etc.) and using landing pages to quickly do that without a lot of dev resources involved. Am I close, or way off? Any landing page I've ever designed had some consideration for the mindset of the user (e.g. "just researching" v. "gotta-buy-now") with a conversion element that spoke to the assumed level of intent behind the source or query which produced the traffic in the first place. "Discount" shoppers were more passive and didn't seem to shop on a 6 month renewal cycle so much as they did as a motivation for cutting their rate. They wanted meaty pages filled with different sorts of discounts, details about who qualified, and whether or not the discount they picked (because you can normally only apply one) was THE BEST discount. Understanding that these were (1) bargain hunters, (2) usually people who didn't have to buy TODAY as a regular function of a renewal process, and (3) were people who were willing / wanted to do a bit more work / research, we produced thicker pages with a short form (which was really just a smaller version of the complete form) that "qualified" them for discounts. After pre-qualifying, they'd pick the discount they wanted, finished the rest of the required information, and the lead was sourced to the companies that offered the discount. "Price" shoppers were very much cut-to-the-chase and seemed to have a stronger correlation to the end-of-policy-term crowd. They wanted to see prices, pick the lowest, and move on with their lives. This presented a problem for us because lead gen sites can't legally present prices, but a workaround we found was was only showing clickable ads that contained a "$" in the copy at the end of the form process. This didn't require a modification of the form and required us to work with advertisers for specific copy output (easier said than done) but, at the end of the day, it did increase CTR substantially by more closely aligning the output with the expectations of someone shopping for "price" - a friggin' $$$ sign at the end of the funnel. The bottom line for you: keep your customers' mindset, level of engagement, level of information they'll part with, and likely expected outcome in mind as you design your landers and you'll do just fine!